An Arts expert admits women have contributed a lot to the development of arts in post-revolution Iran. That the items sold at Tehran Auction fetched more than $4 million in one evening caught the eyes of many. What went largely unnoticed was the fact that Iranian artists had worked at least half a century on those precious items. Iranian works of art have seldom been sold at such a high price, except on a few occasions at the Christie’s. How do you think the Iranian artists pulled off that feat? 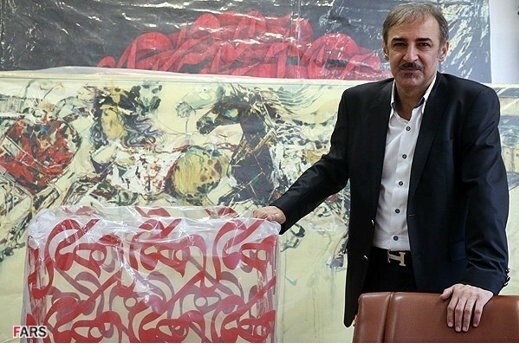 Over the past three decades, specifically after the Islamic revolution, arts has gained much popularity in Iran. A few decades ago, art was limited, to a large extent, to a few big cities, including Tehran, and the number of good artists barely hit the 100 mark. There were only a handful of heavyweights. Arts belonged to the elite, and there were only two schools of art in Iran: University of Tehran’s School of Fine Arts and the Faculty of Arts, which was called the University of Decorative Arts back then. […] Annually up to 70 students would graduate from those two schools, most of whom would seek employment in areas which had nothing to do with arts. After the revolution though, arts in general, and visual arts in particular, gained momentum. Unlike pre-revolution Iran, the number of arts majors is constantly on the rise. It comes despite the fact that arts has always faced restrictions and at times been looked at suspiciously. In short, artists have gone through a lot, but arts in general has come a long way and a new generation of artists has found its way into an array of professions. Did our education facilities have the capacity to accommodate the new art form? These young artists have tried to inject new perspectives into arts, but our education system usually does not tolerate novelty. […] In fact, European Modernism which was introduced to the world through Bauhaus School in Germany and France’s Beaux-arts still prevails in our schools of art. Post-modernism is held at bay, whereas youngsters seek novel thoughts and new artistic waves in satellite TV and on the Internet which are available to the present generation. In fact, students’ interest in research and novel thoughts has prompted them to want to get familiar with the latest developments of the cotemporary world outside classic classrooms. This in turn has turned contemporariness into a very lofty goal for the younger generation. What is interesting to know is that the most important developments of Western arts began to unfold in the East right when we slammed the doors on the West and boarded up our windows. As a result of these developments, Modernism collapsed and was replaced by post-modernism. Today being contemporary has gained a lot momentum among Iranian artists, still our schools of art continue to defy this new tendency. Schools are academic in nature and thus do not tolerate new things which are difficult to teach. Outside this official channel though, many Iranian artists have shown interest in a contemporary look at arts. Although the doors to the world of avant-garde art were closed, our young artists are the most contemporary in the region. They are far ahead of artists in other regional countries who have kept in touch with the West. For instance, when you compare our artists with those of Arabic countries or even Turkey, it becomes obvious that the Iranians are far ahead and the roots of this should be looked for in the fact that Iranians are always in quest of cultural novelty and have built on that quality throughout history to help their culture evolve. They have never had a biased attitude toward other cultures, even those of invaders. On the contrary, they have adopted anything they have found useful in the other cultures. That’s why our culture has borrowed important elements from Arabs, Mongols, Turks, and Europeans and earlier from Greeks and Romans and infused them into its own culture and thus enriched it. That is exactly what is happening on the arts scene now and our arts is marching on contemporariness. However, on certain fronts, for instance on the arts market, some Modernist masters are still leading the way. […] Just like the museums, the arts markets are conservative and have a tendency to stick to Modernist masters. They usually do not get along with young artists. Similarly, arts schools prefer to allow a few decades to pass before making the works of an artist part of their textbook subjects. Museums, schools of art and arts markets are conservative in nature. That is why they pay more attention to masters and less to young artists. They always wait for young artists to mature before putting them on the artistic map. You said doors to with the rest of the artistic world were shut, yet Iranian artists developed an interest in what was on offer there. How can one account for the paradox in this equation? What is so important here that warrants further research is the question as to why the Iranian arts, which was under pressure and felt a lack of support from decision-makers, has made so much progress. […] I can make a guess about the answer, but my response is not based on reliable research. […] No doubt, women have been a major contributor to the development of arts in post-revolution Iran. That is strange too, because there has always been opposition to women’s presence on the social scene. On all social and cultural fronts, women launched a new wave which, among other things, led to the development of arts. In the wake of the revolution, the number of male artists increased two- or three-fold, whereas the number of female artists went up 20-fold or so. In other words, with the stage the revolution set, whether or not it was willing to do so, for women to make their presence felt on social fronts, women found their way into arts and thus the number of female artists rose dramatically. Making a comparison between arts here and elsewhere in regional countries is not enough, is it? Certainly, it is not. We want to be compared with those at the forefront of arts. All Iranian artists want to be present on the most important arts scenes in the world, and in the most famous museums. As I said, our neighbors whose artists have always maintained their relations with avant-garde nations are no more contemporary than we are. Have we managed to fully bridge the gap? Or are we still 20 or 30 years behind? In certain areas the gap has been bridged, and in others we have fallen further behind. That the doors were shut prompted the Iranian youth to use every means available to them to find out what was going on. Those who faced no restrictions and thought they knew what was going on were less enthusiastic. So the attention of the youth has been directed toward learning more and more, but the infrastructure has drawn much less attention that it deserves.